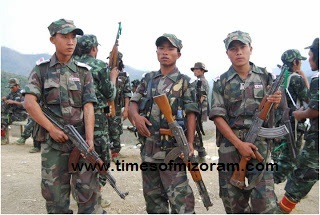 The head of the NSCN-IM Th. Muivah, engineered the infamous Kuki Genocide of 1992-1997 which resulted in the systematic annihilation of more than 1000 innocent Kuki civilians, the burning and razing down of 360 Kuki villages, and the displacement of more than 1 lakh Kukis. Th. Muivah, the General Secretary of the NSCN-IM, instead of being remorseful and repentant for the pogrom he sadistically masterminded upon the Kukis, blatantly continues to lead a life of false pretenses, as if his hands and conscience aren’t soiled with the blood of hundreds of blameless Kukis, which his minions slaughtered mercilessly under his command. The criminal Th.Muivah, after having murdered countless Nagas of Nagaland, Nagas of Burma, and anyone whom he sees as a threat, in a bid to redeem himself and his image in the eyes of the Nagas, and in order to be seen as the Champion of the Naga Cause, came up with the sinister design of ethnic cleansing of the Kukis in Manipur, Nagaland and Assam, based on his hate filled propaganda and pretext that Kukis killed Nagas. Th.Muivah’s devilish ploy was implemented to fullest effect upon the innocent Kuki Civilians, who were slaughtered worse than wild animals by Th.Muivah’s Tangkhul minions in various places. * It is really astonishing that he hoodwinked the Nagas of Nagaland, and established a camp – Hebron, in Nagaland. There is no misunderstanding between the Nagas & the Kukis; one could only glean accounts of co-operation, camaraderie and brotherhood from history. Th.Muivah is a criminal, who is liable to be prosecuted and punished with the severest form of punishment under relevant laws & provisions for his crimes against humanity. Isn’t it time that he is kicked out from Nagaland? It is really heartening to learn from news-reports that the apex body of the Zelianrongs in Assam, Nagland, Manipur – the Zelianrong Baudi, and also the Zelianrong Students had taken a resolute decision not to follow the directives/diktats of Th. Muivah anymore. The Tangkhuls of Manipur originated from the Somra tracts of Burma, and are of a different stock. Even the Nagas in Burma, do not include the Tankghuls as one of them, the Nagas in Burma are Heimi, Nahen, Para, Lainau, Nowa, Makury, and they have no connections whatsoever with those living in the Somra tracts. When the NE Television Network interviewed Mr. Th.Muivah, he repeatedly made the ludicrous & farcical claim that the Kukis are refugees. Isn’t he ashamed of himself making such irrational claims? Such an asinine remark is nothing but laughable, and could only be the ramblings of an infantile mind. It is a remark too embarrassing to be retold even verbally, forget the airtime it was allotted. If Th.Muivah, regards himself as a leader worth his salt, why did he portrayed the Kuki-Chin-Mizo as refugees, is he really that ignorant of the history & demography of the region!!?? Even an illiterate & unlettered person will not believe his absurd and ridiculous claim. I think Mr. Th. Muivah needs a serious self-introspection, so that he can know thyself, before making preposterous claim on other people origins and status. It is truly unfortunate that in a desperate bid to regain credibility & relevance, Mr. Th. Muivah keeps resorting to Kuki Bashing. One has to study minutely as to how the history of the Kuki-Chin-Mizo recorded by writers from British Colonial period until the present time and age. * The historical records pertaining to the Kukis has been written by all writers before the division of British India and British Burma. The name Kuki has been in existence long before the advent of the British Colonial power, from the period of 33 AD, let us trace the chronological sequence of the term Kuki. 4. Sentinels of the North East, a book authored by Maj. General D.K. Palit mentioned in great detail the Kuki Rebellion 1917 -1919. 6. If one looks into the Government of Manipur Law Department, Durbar Assembly 1941 record Part I & Part II, it is clearly stated that there are only 4 Naga Villages in Manpur – Ireng, Konsa, Makhan and Tokpa. Even the aforementioned villages are recorded as Kaccha Nagas. The tribes/community listed on the records are –Kuki, Maring (Old Kuki), Kom (Old Kuki), Koireng ( Old Kuki), Khoirao (Old Kuki), Kabui (Old Kuki) and Tangkhul. The Old Kuki groups living among the Tangkhuls are Mongmi, Kharan, Lairam and Kharam. The original Tangkhuls migrated into Manipur from the Somra Tracts of Burma and settled in North and West of Ukhrul. If we are to go by records maintained at the official level then, there is no record of Naga as indigenous people of Manipur aren’t!?? One crucial point that we all need to seriously ponder over is – Could a self-composed history and culture actually stands the test of time!!?? In the light of the above stated facts, one could simply deduced which of the two Kukis or “Nagas” inhabited first the hills of what is now called Manipur. *Kacha Nagas were first recorded in Manipur only in the year 1941. One with a logical mind and rationale could easily infer as to who the indigenous people are and who are the migrants / the refugees? If we deemed ourselves to be a leader, then one should have the audacity to speak the truth, and not twist history and facts to suit our own whims and fancies. For in the end, Truth alone triumphs - As explicitly stated in the Bible John 8:32 “And ye shall know the truth, and the truth shall make you free”.